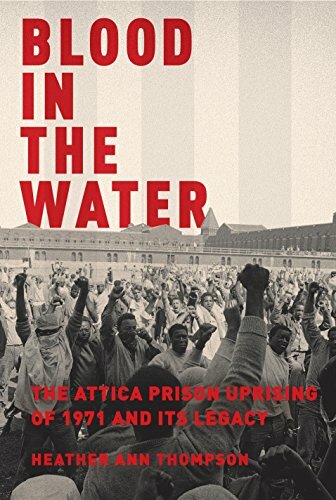 In Blood In the Water: The Attica Prison Uprising of 1971 and Its Legacy, Heather Ann Thompson traces the trajectory of the Attica Uprising from the events that precipitated it through the lengthy legal battles of just a few years prior to her publication. She describes in detail the State of New York’s efforts to cover up its own culpability for the brutality and death that resulted in the New York State Police’s retaking of the facility. Thompson sums up the goal of the uprising while discussing the observers’ efforts at meeting with prisoners. The chants of “Power to the People” were, according to Thompson, “what Attica, at its core, was all about. These disfranchised and seemingly disposable men were determined to stand together, in unity, to make some concrete changes to their lives” (pg. 111). Discussing the beginning of the disaster, Thompson writes, “It was obvious to anyone who was at Attica that members of law enforcement were so riled up that it would be difficult, if not impossible, for them to do their job dispassionately should they be sent in to retake the prison” (pg. 153). She continues, “Whereas the National Guard had a clear plan already in place for bringing civil disturbances in confined areas under control, known as Operation Plan Skyhawk, the New York State Police had virtually no formal training for this sort of action” (pg. 165). Rockefeller and his subordinates feared the image of National Guardsmen storming the prison would too closely evoke Kent State. As the police readied, “although for full days had passed during which those in charge could have ensured that all protocols regarding the distribution of weapons were followed, none of the weapons now being readied for the retaking had been formally recorded. And thus, the men who were about to go into Attica were accountable to no one” (pg. 168). Thompson describes the beginning of the cover-up following the retaking of the prison. She writes, NYSP “Captain Henry Williams went to great lengths to thwart every state effort to ask thorny questions about the actions of his men. And he went even further than that. In the immediate aftermath of the retaking, Williams took it upon himself to make sure as much evidence as possible was collected that might indicate that a prisoner committed a crime…while also making sure that nothing related to the shooting – shell casings, the weapons themselves – was collected” (pg. 288). In discussing Malcolm Bell’s attempt to apply justice evenly, Thompson writes that, despite efforts of NYSP to withhold evidence, “The one thing that [troopers’ statements] did provide, in a few instances, was evidence of which specific prisoners were shot by which specific troopers and, as important, evidence of which troopers had fired their weapons without justification and thus, in all likelihood, criminally” (pg. 409). She continues, “In the course of processing how it was that vital hindering cases had been allowed to implode, Bell eventually came to believe that a serious prosecution of members of law enforcement had in fact been set up to fail from the moment Simonetti had told him to switch his efforts from the shooter cases to cases of hindering the investigation back in August of 1974” (pg. 422). Further, “By the close of fall 1974, Bell had begun to worry that he had stumbled upon an outright conspiracy to protect Attica’s shooters, one that reached to the highest level of his own Attica investigation as well as to the office of the former governor, Nelson Rockefeller” (pg. 435). This led Bell to turn whistleblower in an attempt to expose the truth, though the State of New York managed to mitigate his revelations. The state further betrayed the hostages, many of whom were state employees, by tricking them into accepting workman’s compensation in order to prevent them from filing a lawsuit. Thompson writes, “Without formally filing for workman’s compensation, the checks simply showed up soon after the retaking. Unbeknownst to the recipients, the instant that an Attica survivor or widow signed and cashed one of these checks, under New York state law they had ‘elected a remedy,’ which meant that they could no longer sue the state for damages” (pg. 518). In discussing the former hostages’ and their relatives’ attempts to sue the state, Thompson writes, “Getting a state official to acknowledge under oath who had shot John Monteleone, a hostage who had later died from that same shot, was huge. For the purposes of this lawsuit it confirmed just how excessive and brutal the shooting during the retaking had been. Of course it also confirmed that state officials were aware who had killed whom at Attica – the very point that Malcolm Bell had been trying to make when he went public back in 1975” (pg. 524).